Thermal imagers detect and display differences in infrared energy, using those differences to make greyscale or color images. Infrared energy is part of the electromagnetic spectrum with wavelengths long enough that they can’t be seen by the human eye. Because of this, thermal imagers can create images without using visible light, enabling them to detect very small temperature differences in total darkness, as well as through smoke, dust, and light fog. Everything on earth gives off infrared energy – even ice. In fact, anything above Absolute Zero – the temperature at which all molecular activity stops – theoretically emits some level of infrared and can be detected by a thermal camera given the right conditions. The warmer an object becomes, the more heat energy it emits. The type of electromagnetic energy we’re all the most familiar with is visible light. 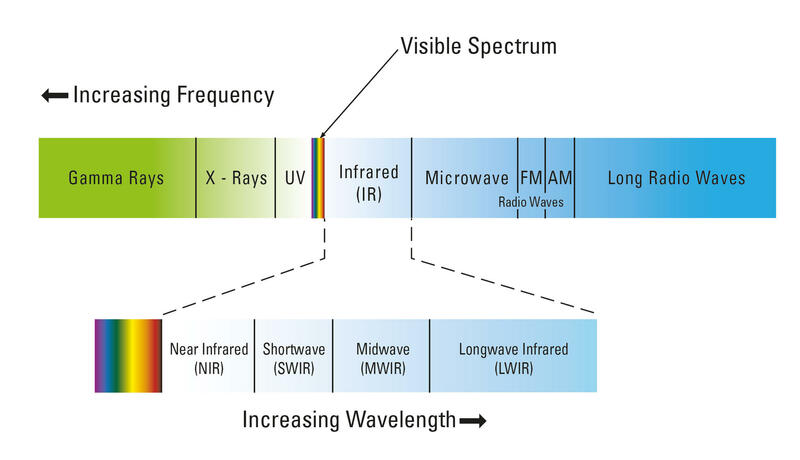 Visible light is actually a very narrow waveband, only encompassing the range of 0.39 to 0.75 micrometers (μm). The infrared waveband is much larger by comparison, beginning near 1.0 μm and ending at 1,000 μm. Thermal cameras capture the infrared energy that is all around us and use that energy to create images or data points through digital or analog video outputs. A thermal camera is typically only sensitive to one of the wavebands we discussed earlier: either MWIR from 3-5 μm or LWIR from 8-14 μm. Although there are exceptions, for the most part MWIR cameras require the infrared detector to be chilled to roughly 77 Kelvin with an on-board cryogenic cooler in order to create an image. These coolers add size, weight, complexity, cost, and require periodic maintenance. Uncooled LWIR imagers – like Lepton and Boson – can create images at ambient temperatures, so they’re smaller, lighter, less complex, and less costly than their cooled counterparts. The camera itself is made up of a lens, a thermal sensor, processing electronics, and a mechanical housing. The lens focuses infrared energy onto the sensor (also called a detector). LWIR detectors from FLIR are made of Vanadium Oxide (VOx), which is the most sensitive material for detecting longwave radiation and doesn’t produce the image artifacts typically produced by detector materials like Amorphous Silicone. These detectors are actually an array of detector elements, and can come in a variety of pixel configurations, the most common of which are 320x256 and 640x512. This is the resolution of the detector. While these resolutions seem quite low in comparison to visible light imagers, there’s a reason for that. The individual detector elements themselves are much larger in thermal cameras than they are in visible cameras – visible cameras have pixels that are only 1-2 μm, while thermal camera detector elements are 12-17 μm each! This is because thermal detectors have to be able to sense energy that has much larger wavelengths compared to visible light, requiring each sensor element to be significantly larger. As a result, a thermal camera usually has much lower resolution (fewer pixels) when compared to visible sensors of the same mechanical size. After the thermal energy hits the detector, the readout electronics convert it into a signal that can either be passed out of the camera, or – with cutting edge cameras like the FLIR Boson – go directly into systemon- a-chip circuitry. This SOC gives the camera built-in capabilities like image processing, analytics, and other advanced capabilities that used to require back-end electronics developed by the integrator. Lenses used in thermal cameras from FLIR are made of Germanium or Chalcogenide, because those materials are highly transparent to longwave radiation. Thermal cameras can’t use the same lens materials as visible light cameras because those materials effectively block all of the infrared energy from getting to the detector. This also explains why thermal cameras can’t be used to see through.